Perth Amboy Artworks– Perth Amboy Artworks is a nonprofit organization that produces public art and pop up events. Most recently they have produced a Live Music Series at the Ferry Slip, a 650 ft mural on the waterfront walk, pop-up cinema and Paint and Sip events. La Casa de Educacion y Cultura Latina, Inc. (LCECL) is a nonprofit organization established for the purpose of preserving, producing and celebrating the shared cultural heritage and values of Latinos throughout New Jersey. The have produced concerts, art shows, and offered music education in Perth Amboy. Perth Amboy Arts Council– The Perth Amboy Arts Council was founded in 2014. The Arts Council promotes Arts & Culture in Perth Amboy. They are a City Council appointed board of 9 members and 2 alternates who meet monthly at the Perth Amboy Public Library. Applications to be on the council can be made at the City Clerks Office in City Hall. Perth Amboy Gallery Center for the Arts– The Gallery was established by the City of Perth Amboy and is located at 339 Reade St. It is run by the Perth Amboy Department of Recreation via City Arts Coordinators. The gallery hosts art shows, events and classes. They also operate an excellent summer youth art camp and a youth mural program called “mural punks.” The Perth Amboy Department of Recreation hosts an annual Waterfront Arts Festival in May. Perth Amboy Creative Placemaking Plan– Creative Perth Amboy is an award winning plan funded by the National Endowment for the Arts (NEA) created by the Perth Amboy community with help from the National Consortium on Creative Placemaking. The plan empowers economic and community development in Perth Amboy through Arts & Culture. Perth Amboy Public Library– The library hosts art shows, film festivals, authors and many other arts and cultural events. Perth Amboy Community Theatre- Throughout the year, auditions and productions are held of original and familiar theatrical productions. Puerto Rican Association for Human Development– PRAHD hosts arts and cultural events featuring music, dance, film events with directors and more. 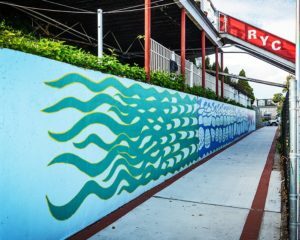 PARTNER– The Perth Amboy Redevelopment Team for Neighborhood Enterprise and Revitalization holds art events and sponsors murals to help revitalize the Gateway Neighborhood in Perth Amboy. Perth Amboy Business Improvement District– Hosts music, food and cultural events throughout the year. Annually hosts the Taste of Perth Amboy event in October.